Sanitary Design with all dilute stream connections in sanitary tri-clamp connected 316L stainless steel. Electrodeionization cells by E-Cell fabricated of FDA approved materials. Thornton CR200 conductivity / resistivity meter with sanitary probe. Sanitary product water flow meter with diaphragm control valve. Validated 0.1 µm absolute final filter. XANTREX regulated DC power supply. Product water divert to drain upon startup to flush lines and verify quality. Isolation/Divert valves to facilitate optimum EDI module cleaning. Pure water production starting at 56 L/min (15 US GPM). 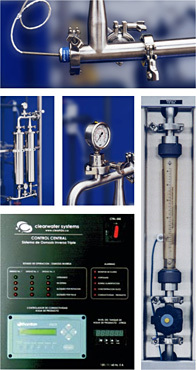 The Clearwater line of CWEDI Electrodeionization systems produce high purity water (>16 MΩ resistivity), continuously and without the use of chemical regenerants. 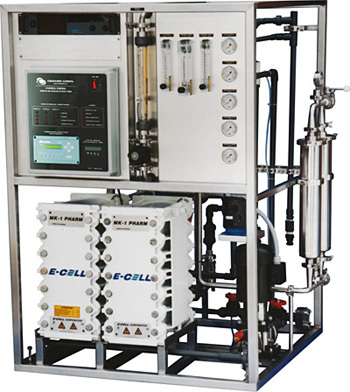 Systems are modular, expandable, and may be configured to suit any specific application requiring ultra pure water including USP purified water, Labwater and feedwater for high pressure steam.